May 30, 2013 will mark the fifth anniversary of the founding of our beloved city. In 2005, we faced a daunting challenge. We knew at that time that we could no longer sit idly by and allow others to determine the fate of our community. So we began a three year struggle to incorporate our community into a city and secure for ourselves and our children the right to determine our collective destiny. And after achieving our goal of creating the City of Von Ormy, we took up the challenge of our time, the challenge of self-government – to build a city from the ground up. We can look back on these first five years with pride and satisfaction that we have indeed improved our community. In this short time we have brought additional services such as street lighting, uniform trash collection, an 11 member city marshal’s office, curbside recycling, a city park, animal control, litter and graffiti control, a municipal court, paved Oussett Lane, Francisco Ruiz Lane and resurfaced nearly all others. And we have in progress a city hall/community center, city marshal command center, fire station, park trails and reconstruction of Quarterhorse Road. We have ended over 20 years of exploitation of our residents by the VIA Metropolitan Transit Authority who had taxed us for years without providing service and replaced it with a Community Development Fund that invests in our city. We can be additionally proud of how we have done it. We have passed every public audit with the highest possible rating. We have saved over $100,000 in an emergency reserve fund. We have run surpluses each fiscal year. We have refused to go into long term debt and insisted on a pay as you go strategy. By understanding our community assets and emphasizing our strengths, we have established a tax base which is mostly paid by non-residents. We have been able to reduce property taxes by nearly 10% each year the past three years while increasing revenue to the city by over 50%. Additionally, we have also established the practice of neighborhood meetings to take City government into our neighborhoods to listen to the concerns and needs of our residents. People have taken notice. The San Antonio Current has called us “visionary.” The Express-News just last week reported, “Von Ormy takes another major step forward." And the week before the Express-News opined, “it’s hard to imagine that the town would embrace that level of innovation.” Well we have. And we will continue to break the mold of government as usual because since the first generation of Von Ormians, our city has been home to pioneering people who have survived and thrived on the principles of hard work, innovation, faith in God and caring for your neighbor. The motto of our incorporation effort was “Empower Our Community With Opportunity” and we have done just that. This year alone Brooks Academy of Science and Engineering has announced plans to locate a K-8 campus in our city. Our newly formed Von Ormy Film Commission is highlighting our local talent in multiple venues. And the Von Ormy Community Foundation is supplying reflective address signs so our emergency responders can more easily locate residents in their time of need. I am proud to say that after five years, the State of the City is strong. 2013 will be remembered as a year of construction in Von Ormy. Our park, fire station and municipal building will be erected. But as we move forward we must insist on investing in and proving expanded opportunities for our residents through education, economic development and public services. Among our priorities for 2013 is passage of a zoning ordinance. 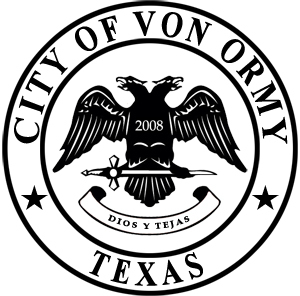 With our increase in economic development our city is experiencing the establishment of commercial and industrial uses throughout Von Ormy. Zoning will protect the residential character of our neighborhoods and strengthen our commercial corridors. It will also qualify us for state assistance with our sewer projects and allow for transfer of extra-territorial jurisdiction from San Antonio in our northeast quadrant, including Neighborhood Road and the Medina River. We must focus on the development of our City Park to allow for greater functionality. Walking trails, internal lighting, enhanced parking and event functionality will be immediate needs. Upon the completion of our municipal building we will focus on establishing senior services, recreational and educational opportunities for residents. In 2013 we must also focus on the expansion of Emergency Services. The new Jarrett Fire Station will be a great boost to response times and lower home owners’ insurance rates. We will continue to strive to keep pace with the growth of the city and establish a permanent location for our City Marshal’s Office and expand coverage by increasing the number of patrol units and officers in the department. We will continue to look for ways to finance a sewer main project to bring wastewater services into the city. And as will grow our Partnership with the City of Somerset to plan and develop the 1604 corridor that connects our two cities. After five years, our needs greatly outweigh our resources and we have much work to do. But we know from our past that in challenging times Von Ormians rise to the challenge and we will continue to rise. May God Bless each one of you and our City of Von Ormy. eToro is the best forex trading platform for beginning and full-time traders.